Product #21179 | SKU 041127 | 0.0 (no ratings yet) Thanks for your rating! The Rycote 41127 Table Stand with InVision 7HG Mark III Mount allows a microphone or a recorder to be mounted on a flat surface, leaving both hands of the recordist free. It is designed for use in broadcast studios or for location recording where a desk or other flat surface is available. The Rycote Table Stand is 70mm round and has a non-slip base. It features a 3/8" screw thread into which Rycote microphone suspensions and audio recorder suspensions. 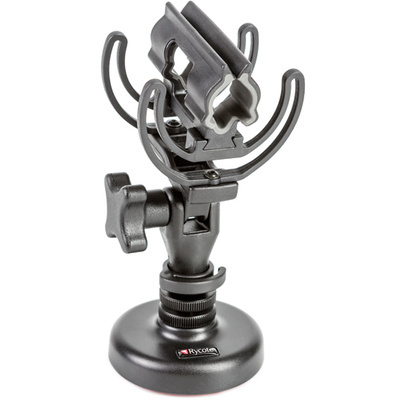 The InVision 7HG Mark III Mount holds microphones from 19 to 25mm in diameter and will securely hold microphones of up to 250mm in length when mounted in this table stand. The Lyre web decouples a mounted microphone efficiently from this table stand, resulting in the minimum of vibrations (and thus unwanted noise) being passed to the mic capsule.